Pope Francis has engaged in a powerful and dramatic gesture while meeting the Sudanese leaders who have been tasked with ushering the embattled nation into a new era or peace. Francis knelt down to kiss the feet of South Sudan’s President Salva Kiir and his former arch-enemy, rebel leader and former Vice President of the South, Riek Machar. In 2013, the two influential leaders clashed, sparking a civil war that claimed the lives of almost half a million people. Speaking to the leaders of independent South Sudan, which is predominantly Christian, Pope Francis implored them to find common ground and sow the seeds of peace in this new political era. “I am asking you as a brother to stay in peace. 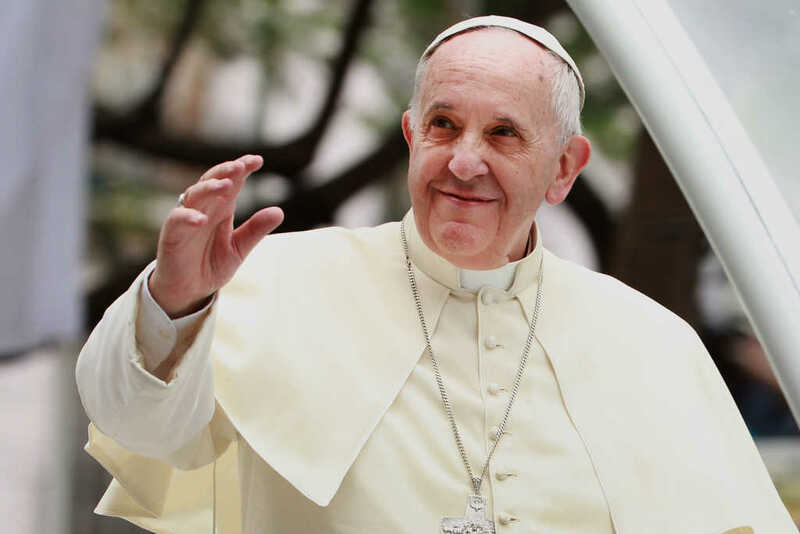 I am asking you with my heart, let us go forward,” the 82-year-old pontiff said after he performed the rare gesture, according to the Irish Times. The Sudanese leaders were in attendance at the Vatican for a two-day spiritual retreat. Archbishop Justin Welby, the head of the Anglican communion, was also there. Clearly emotional after the stunning show of humility, Welby offered his own words of encouragement and blessing. After months of protest, the Sudanese president of 30 years, Omar al-Bashir, was ousted by the military Thursday. The government was immediately dissolved, with the army declaring a state of emergency and announcing that democratic elections would be held after a period of transition. “I announce as minister of defense the toppling of the regime and detaining its chief in a secure place,” Mr Ibn Auf, the country’s defense minister said in a statement, according to the BBC. The former Sudanese government, led by the National Congress Party, subjected its citizens to Islamic Sharia law and has been cracking down on Christianity, along with committing genocide against non-Arabs, for years. In 2010, the now former President Omar al-Bashir was indicted by the International Criminal Court (ICC) on charges of genocide and ethnic cleansing, but was never convicted due to jurisdiction issues. In essence, because Sudan is not a state party to the Rome Statute, which established the ICC, the government claimed that the ICC does not have the legal grounds to execute an arrest warrant in the country’s territory. While it remains unclear what will now happen to Omar al-Bashir, who is currently being detained by the military, there is still a possibility he will be extradited and prosecuted for his crimes. Between 2003 and 2008, an estimated 300,000 people were killed as a result of the Darfur conflict, which stemmed from al-Bashir’s desire to separate Arabs and Africans. The conflict has also resulted in “1.1 million internally displaced persons or severely affected persons needing humanitarian assistance,” according to the CIA World Factbook. Darfur is still extremely dangerous, with the US State Department keeping a Level 4 “Do Not Travel” warning in place for the region. According to Open Doors USA, there are currently around 2 million Christians currently residing in Sudan.